Color wheel. HSB color control with hue ring and saturation/brightness square. 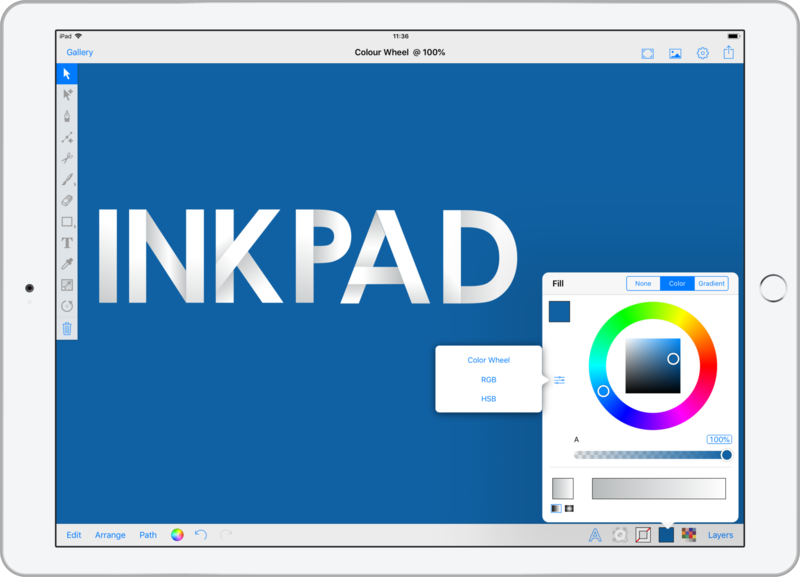 I first discovered Inkpad back in 2012 and as much as I have loved it over the years, there has been one feature that was missing. When Derek took over Inkpad, my first request was to update the colour inputs. Our previous update introduced keypad and hexadecimal color inputs, which was great, but we all knew there was something else missing. Well I’m very happy to tell you it is here. Yep, Derek has added a colour wheel. You access the color wheel from the slider graphic on the left of the colour palette, like you would to switch between RGBA and HSBA. The colour wheel is made up of the outer Hue Ring and the inner Saturation and Brightness Square and provides a more intuitive method for navigating the HSB color space. The Hue Ring represents the pure color, without any tint or shade. Within the Saturation and Brightness Square, moving from left to right increases the saturation level, while moving from top to bottom decreases the brightness level. You can switch between the colour wheel and HSV/RGB sliders at any time depending on how you need to select or visualise your colors, without the actual color being changed.